In my report I would like to share our experiences gained in the organisation, methodology and work of the Chto Delat’ School of Engaged Art in its function as an experimental initiative in radical education and an attempt to create a sustainable structure that can be a factor in the qualitative change in the artist communities of St. Petersburg and Russia. The School of Engaged Art is a project taking a further step in the long-term practical work by the Chto Delat’ collective which is focused on creating educational initiatives; in the on-going situation where the public domain in Russia is being destroyed, it is one of the possible responses to the general inability to continue developing institutions based on critical thought. 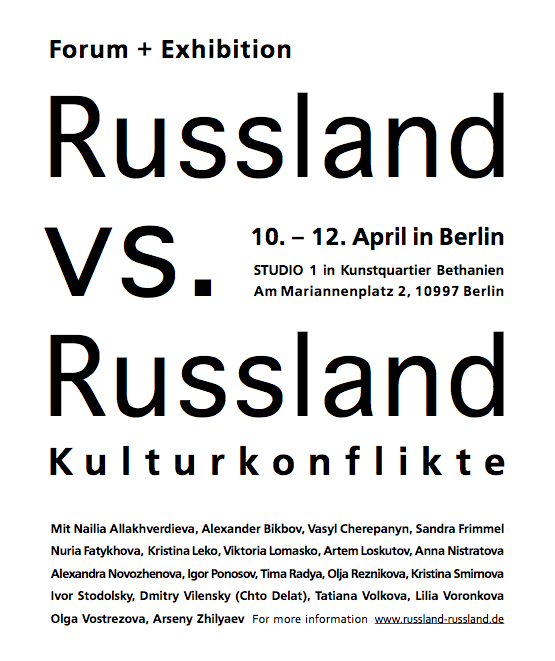 Which kind of art education is most needed in Russian context, in the current situation where basic democratic freedoms are endangered and violence in society is approaching a critical level? We have a situation where any form of support for independent critical culture is lacking and academic curricula on contemporary art are virtually non-existent. We believe that art can and must go hand in hand with all the painful transformation processes in the society; that it is important today to practice art that does not hide behind the security of institutional ghettos and conformity of curricula. It is important for art to free itself from the formalist approach regarding political and social questions, to be capable of addressing a broad audience instead of a tiny group of professionals who can understand linguistic sophistry. In order to achieve this, we need to accumulate the knowledge from different subject areas with the aim to use this knowledge in the most unorthodox manner. We need to cross poetry and sociology, choreography and street politics, art history and militant studies, queer science and dramatic theatre, political economy and the sublime, rights of culture workers and romantic view od art as a mission and so on. Our School is also special because it openly declares that it is true to the leftfield tradition of modernist art and at the same time tries to avoid any dogmatism in its political approach. We want to experiment with true practices of equality and liberation that are still alive despite all the traps set by the current political situation. To achieve this, it is crucial to demonstrate a sustainable alternative to the private interests of oligarchs and corporations, to the senseless machinery of mass entertainment and harsh suppression. Art is a common cause – as indeed are true politics – and ten years of our activities have been based precisely on this principle. The same can be said of the Rosa Luxemburg Foundation, an institution that supported our initiative. Now is the time to establish these ideas in educational practices.